These swords are on closout sale. Once current inventory is gone the will no longer be available. Some of the items may have some minor discoloration but they have been marked down 50% or more to compensate for the imperfection. This high performance LARP sword is styled after the medieval infantry or Footman's sword. We offer this sword in two color accents and two sizes. The color accents, gold and steel are applied to the pommel and guard. All models feature a steel color blade. The available sizes are long and medium. The long models are 39 inches overall with a 31 inch blade. The medium models are 32 inches overall with a 25 inch blade. This is a wonderfully crafted LARP sword. It is designed for both durability and safety. These swords are manufactured using state of the art technology. 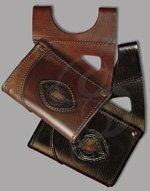 They are designed to be durable, safe and extremely attractive. 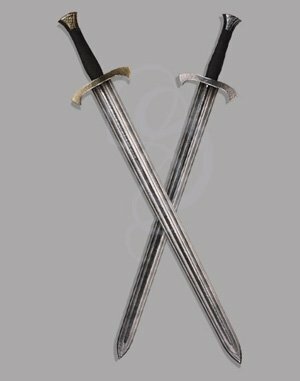 The manufacturing process starts with a round carbon-fiber cores that make these swords and daggers astoundingly strong, flexible and springy. The cores feature special structural reinforcements around pressure areas like the joint between guard and blade. This prevents the sword from breaking or folding at areas of high stress. The swords are constructed of proprietary multi-density foam. This complex sounding sentence means that there is a small layer of dense foam around the core and a larger, softer layer of foam to make the shape of the sword. This makes for a very safe sword that can withstand incredible amounts of punishment. These swords feature another design aspect unique to them: A Vari-flex Tip design. This is a design feature in the tip that allows them to bend gradually rather than abruptly. This prevents stress on the tip and makes it almost impossible to cause creasing or weak spots that could lead to breaks. A revolutionary and proprietary painting technique is used on these swords that is engineered to reflect light exactly as real metal would. The paint is also designed to protect the sword, providing a strong barrier that stretches slightly with each flex. In order to keep your foam or latex sword in the best possible condition we offer an ultra high quality, low contaminant silicone spray. Click to view more details..
We offer sword hangers for both left and right handed warriors. They are available in various colors. Click to view more details.